New: 1 LOT of 17 Model Kits, all are 1/25, 1/24 and 1/20 Scale. 15 sealed, 2 unsealed (AMT Ford Courier and Chevrolet Xtreme), but complete and factory sealed inside. Do Not Ask to separate. AMT (2) 1/25 Ford F-150 XLT Longbed SEALED. AMT 1/25 1950 Chevrolet Stepside SEALED. Revell 1/24 1977 Chevrolet G10 Short Van SEALED. Lindberg 1/20 GMC Sonoma 4x4 Truck SEALED. Revell 1/24 1977 GMC C-30 Wrecker SEALED. AMT 1/25 Chevrolet S-10 LS Blazer SEALED. Monogram 1/24 Ford F-350 Exteded Cab Dually SEALED. Monogram 1/24 Ford F-250 Extended Cab Longbed SEALED. AMT 1/25 Chevrolet S-10 Sportside SEALED. Revell 1/24 Datsun (Toyota) 4x4 Off-Road Truck SEALED. Revell 1/24 GMC 4x4 Longbed with Snowplow SEALED. AMT 1/25 Chevrolet Custom Fleetside Truck SEALED. AMT 1/25 GMC Sonoma SLS Longbed SEALED. Revell 1/25 Jeep Wrangler Rubicon SEALED. AMT 1/25 Ford Courier Stepside Open Box Sealed Inside. AMT 1/25 Chevrolet Xtreme Sport Truck Open Box Sealed Inside. Wonderful addition for any model kit appreciators or collectors! Please inspect the photos as it is part of the description. I will be listing other models and items as time permits. 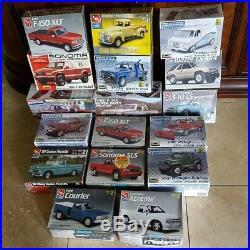 The item "LOT of 17 Revell, AMT, Lindberg and Monogram Pickup Truck Model Kits" is in sale since Wednesday, December 27, 2017. This item is in the category "Toys & Hobbies\Models & Kits\Automotive\Vintage". The seller is "vicviral" and is located in Hudson, Florida. This item can be shipped to United States, Canada, United Kingdom, Denmark, Romania, Slovakia, Bulgaria, Czech republic, Finland, Hungary, Latvia, Lithuania, Malta, Estonia, Greece, Portugal, Cyprus, Slovenia, Sweden, Belgium, France, Ireland, Netherlands, Poland, Spain, Italy, Germany, Austria, Mexico, Switzerland, Norway, Ukraine, Croatia.